When it comes to Brazilian Jiu-Jitsu and combat sports in general, aspiring superstars are beginning to hone their skills by training at a younger age. Provided it does not interfere with their physical development, training early can be a benefit to physical fitness, as well as a means to build confidence and a greater sense of self. Here are several pictures of Nicholas working on the finer points of today’s lesson on the triangle choke and more. Video – Nicky Calimbas demonstrating the “baby triangle Choke” on an unsuspecting Gus-Gus. To learn more on Brazilian Jiu-Jitsu and Mixed Martial Arts, check out MoptheMats.com. Becoming a Dad – Our Son Nicholas is Born! See…. I told you guys I’d get it right! 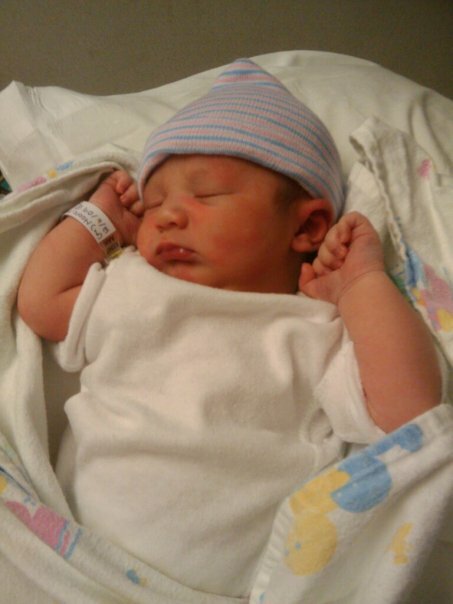 Our baby boy, Nicholas Leonardo Calimbas, was born at 7:24am today, December 6th 2009 at TX Women’s Hospital. He was 7 pounds 5 ounces and 20 1/2 inches long at birth with feet and lips like his momma. He arrived after 40 weeks and 5 days …. on St. Nicholas Day! It was funny how it all started. After passing our due date, we never thought he’d get here! You know… Filipino time and all. We were already hearing whispers of how this one… Michael Angelo… Max Kristoffher, Romulus Maximus Decimus Meridius… whatever his name is… was JUST like his daddy. Always late, comfortably lazy, and not wanting to get up and give up the free food. But just like they said it would happen, he arrived when we least expected it. At this point, mom-to-be and I had just about given up on the idea that he (baby name TBD) would arrive on his own. Dr. Ramos had set an induction date of Monday and we were just riding out the weekend after our expectations of him arriving Thursday and last Saturday came and passed. I had come home after watching the Ultimate Fighter Finale at the newly-remodeled Casa De Filipino with the boys. Megan had already gone to bed and I was knee-deep in a COD4 XBOX Live session with Rico, Hai, Drew, and Vinnie when Megan texted me that she thought it was time. I quickly logged off and ran upstairs to find Meg in the middle of a contraction. Not harmless Braxton-Hicks ones like what was the norm… more like your-face-looks-like-somebody-just-stabbed-you real ones! So in my head, I’m like wow… it’s really happening! At this point, its now 2:30am and the contractions had been going on for 10 minutes. Not really knowing what to do, I coached Megan to cope with the pain by controlling her breathing as I started timing. 5 minutes apart… I have no idea what the heck that means but you look like you’re in pain and that seems a little close together. Time to call the doctor… err… answering service. Doctor calls back. Contractions now 3 minutes apart. She says wait until its been a full hour then come in. I thank my lucky stars that the to-go basket is packed as Megan and I get dressed in between contractions. Car seat… check. Bags and stuff we needed… check. Car has gas… check. We arrive at the hospital at about 3:15am or so and at this point, Megan is in pain as she walks down the hallway to get admitted. But we make it and since we filled out the paperwork a few visits ago, admittance is fairly easy and she’s in the room getting an epidural in no time. For those of you that don’t know what that is… it completely takes the pain away. And they like to deliver babies in the morning, after 7am, so the nurses tell us to relax and try to get some rest/sleep. Yeah right. I finally start dozing off around 6:30 when we find out the baby is ready to get here. I’ll spare the gory details but I assisted in the delivery. I held momma’s leg and cut the cord and everything. He got here in 4 pushes. And he wasn’t purple or yucky or any of the other stuff I expected to see. He was already a healthy pink color, with a full head of black hair and (currently) bluish, greenish eyes like his mama. They didn’t even have to suction his nose/mouth before he started crying. Easiest delivery in 5 months, the nurses said. And I held him immediately after they cleaned him off and put a diaper on him. It turns out he’s not as fragile as I thought he’d be. And loud too! But he stopped crying as soon as I picked him up and I held him while momma got ready. So yeah. His name is not Michael Angelo or Max or Romulus or any of that. His name is Nicholas. A name we decided on within the last 24 hours. And as I was so aptly told by my loving mother-in-law, wouldn’t you know it… he was born on St. Nicholas Day! Kind of ironic since his is the only stocking over the fireplace without a name on it. But Dad will change that as soon as we get home. I finally cried my eyes out a little ago while I was holding him in this quiet room. Just Megan, baby, and I. Totally the “you are my son and we’ll tackle this world together” moment. Looking over, I see Megan is finally sound asleep after a full day of feeding and family. Now this dad needs his sleep too. Welcome to the world son. Becoming a Dad – Racing to the Finish Line! Due Date – December 1st: 3 weeks and 1 day to go. Don’t let the due date fool you, the day after Thanksgiving is my prediction. I fully expect our baby boy to arrive sooner rather than later! Mom-to-be and I had our 36-week OB appointment last Friday and saw our son for the first-time since August. Prior to the visit, I had friends tell me that we’d be able to tell what he would look like on this visit. I’d been trying to picture this baby in my head without a clear visual so naturally, I was very, very anxious to see him. This visit was a mixture of amazement and disappointment. The part I was down on was the lack of a 3-D ultrasound. As you can see by the picture of baby, we didn’t get the full picture of what our son looks like quite yet. I don’t know if he has mommy’s nose or dad’s facial structure, etc. Though I have a sneaking suspicion he’ll have his mother’s lips. And on top of all that, he was frowning! All in all, mom-to-be are both just really anxious. It’s still funny how the first six months or so of this pregnancy went by so deliberately. …and how this last trimester has seemed to skate by us… yet at the same time, we’re stuck in what feels like an awkward limbo. Not quite resigned to being pregnant anymore, yet not quite parents just yet. We just want our baby to arrive now! ….But not now, now – if that makes sense. I want my Thanksgiving turkey first. PS – Anybody have name ideas for us? Please comment on this blog. We could use the help! Fatherhood is vastly approaching. An estimated 36 days by the official count and about 25 days by prediction. The past eight months I’ve been blogging about everything that has to do with the ups and downs of becoming a first-time dad, and everything sideways too. From pregnancy hormones and car accidents to hospital visits and baby showers, I feel like I’ve written about almost everything. Now we can all relax. The big day is upon us and soon enough, you all will no longer have to hear all my non-stop ramblings. lol. As I think beyond the changes I’ve made and how I’ve grown throughout this journey, I’ve come to deeply appreciate the support and love of the friends and family, All of you who have chosen to share in the experience of my becoming a father. In my last entry, I remarked about feeling overwhelmed at the show of love & generosity our friends put on at our baby shower. In hindsight, I guess I’ve been feeling this way all along… completely amazed at gestures of selflessness thrown our way. Friends, family, teammates, co-workers… You’ve all been there for us and we deeply,deeply appreciate it. I’d name names but there’s just too many of you and admittedly, I don’t want to leave anyone about. But you know who you are. There’s just no greater feeling in the world than knowing you are loved and cared out. We’ve gotten a lot of gifts but that’s the one we appreciate the most. Thank you cards and all that are coming but Megan and I plan on repaying your gratitude in the best way we can – through being the best parents we can be this little boy. Guys… seriously… I want you all to know exactly how much Meg and I love this kid but I wouldn’t be able to find the words to do it justice. One thing’s for sure though – After spending this past weekend washing clothes, putting furniture together, and generally nesting – I can truly say I am ready and excited for my boy to get here! (and not a moment too soon! Thanks for reading. Love you guys. Today marks the 50 day countdown to our anticipated due date! You know what that means? It means this baby could be coming in just a few weeks, depending on when he decides to make his way into the world. Based on how stubborn and impatient his parents are, mom-to-be and I are both thinking that time could be sooner rather than later. So yeah…. every day from now on is going to be filled with anticipation. Wow. Two months shy of having our baby baby with us. What a sobering thought. So much still left to get done. Laying in bed last night, Megan and I had a quiet chance to reflect on the past 7-8 months of this experience. We’ve been so blessed within this pregnancy to not have experienced many of the common complications of many pregnancy. Stuff like gestational diabetes, kidney stones, and hemorrhoids… Or even nosebleeds, infections, H1N1, or illness of any kind. What a blessing it continues to be to not have to deal with any of that stuff. For that we feel so fortunate. It makes every other sacrifice and committment we’ve had to make seem so trivial. It’s nice to reflect on the good stuff every once in awhile. Now we can face the these last fifty days with strength knowing that the wind is on our backs for the rest of the journey! One last thing – Megan and I went to a 4-hour ‘Life with Baby’ course this past weekend that gave us a lot of material. Gone is the fear of the unknown. Now I know what I’m scared of. lol. Cue dirty diaper powerpoint in my mind.LOL. 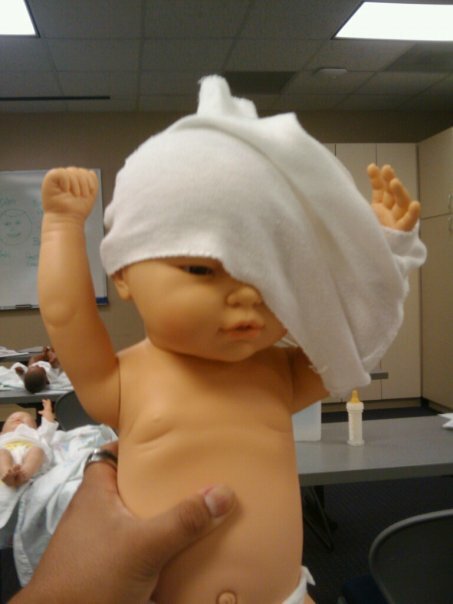 In all seriousness, this class covered everything from infant characteristics & diapering to safety, breast feeding, and how to deal with crying. Very helpful indeed. I’ll be covering all those in my next blog so don’t miss it.